Comfortable rooms, suites & mini apartments next to the lifts of Mt. 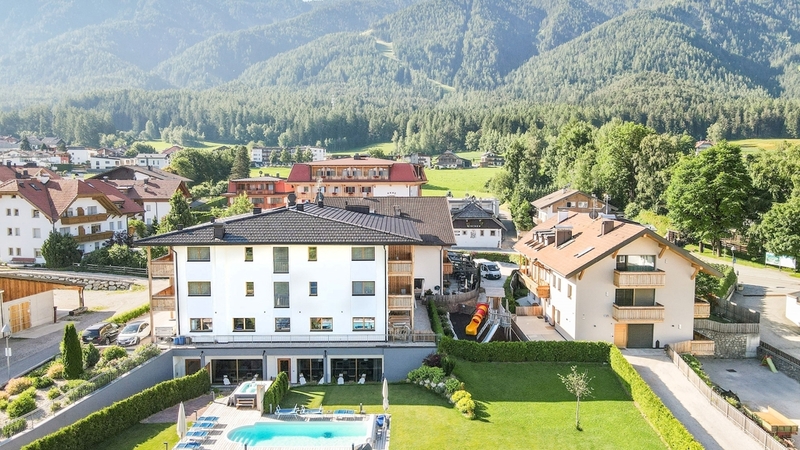 Kronplatz skiing and hiking area, sauna & steam bath, fitness room & inviting garden. Welcome to Hotel B&B Feldmessner *** in Reischach near Bruneck! Hotel B&B Feldmessner is situated in a sunny location in the centre of Reischach, a small village at the foot of Mt. Kronplatz – South Tyrol’s most popular skiing area. Here you can allow yourself a pleasant holiday in an inviting atmosphere with a lot of sports and relaxation. With new rooms and suites, classic rooms as well as a mini apartment, which are furnished with loving care, we fulfil our guests' demands. The well-tended garden invites you to stop for a moment and to recharge your batteries surrounded by an idyllic natural landscape. In the new sauna landscape, you can enjoy the soothing warmth of the bio herbal sauna and of the steam bath, and regenerate in the relaxation room with magnificent panoramic view afterwards. The new fitness rom offers innovative fitness equipment made of wood. Every day in Hotel B&B Feldmessner starts with a rich breakfast buffet with sweet and hearty delicacies, which you can enjoy in our rustic living room. After that you can start to your favourite activities right on our doorstep: from varied hiking and biking tours in summer to endless skiing and snowboarding fun on the slopes of Mt. Kronplatz in winter. Our guests have free access to the swimming pool in Bruneck in summer. In the nearby Cron4 indoor pool with spacious sauna landscape, our guests are offered reduced ticket prices. Large double room ca. 30m² for 2 – 4 persons, wooden floor, with native larch furniture, automatic aeration, writing desk, phone, mini-bar, safe, divan bed, flat-TV 32’’ with satellite and radio. Bathroom with rain shower, WC, bidet, hairdryer and makeup mirror. Balcony with beautiful view of the Dolomites. Free internet access. Non-smoker-room. Large double room ca. 25 - 30m² for 2 – 3 persons, wooden floor, with native walnut furniture, automatic aeration, writing desk, telephone, mini-bar, safe, couch, flat-TV 32’’ with satellite and radio. Bathroom with rain shower, WC, bidet, hairdryer and makeup mirror. Balcony with beautiful view of the Dolomites. Free internet access. Non-smoker-room. Suite ca. 35m² with two separate bedrooms for 3 – 5 persons, wooden floor, with native oak furniture, automatic aeration, telephone, safe, couch, flat-TV 32’’ with satellite and radio. Bathroom with rain shower, WC, bidet, hairdryer and makeup mirror. Balcony with beautiful view of the Dolomites. Free internet access. Non-smoker-room. Ordinary double room with carpet. Equipped with a hairdryer, safe, telephone, free WIFI, satellite – TV, radio and a small bathroom without bidet. Also a balcony is available. No – smoking room. Ordinary double room with carpet. Equipped with a hairdryer, safe, telephone, free WIFI, satellite – TV, radio and a small bathroom without bidet. No balcony. No – smoking room. Ordinary double room with separate beds and carpet. Equipped with a hairdryer, safe, telephone, free WIFI, satellite – TV, radio and a small bathroom without bidet. Also a balcony is available. No – smoking room. Our fully equipped mini apartments with bedroom, bed linen, kitchen or kitchenette, tea towel, cooking pot, dishes, coffee machine, small bathroom without bidet, towels, hairdryer, free Wi-fi, daily cleaning, final cleaning, satellite TV, safe, telephone, radio and balcony are perfect for 2 adults and 1 children.